It has been crazy busy at the Crosstitchery household, getting ready and planned for one of my best friend’s kitchen tea / hen’s in the lead up to her wedding. We celebrated it this weekend with a bohemian themed day & night adventure. It’s been about 2 months in the planning, so to have it go off without just a few minor hitches was a HUGE relief – I really just wanted my friend to have an amazing day and night to remember, and I’m 99% sure that is the case .. so big win! I catered a lot of the food for the event, including some cupcakes for the afternoon tea portion. I had originally ordered some handmade heart cupcake toppers and confirmed prior to ordering, that I would receive them by the 15th of January, as I needed them on the 16th of January. Unfortunately, they didn’t arrive on the 15th, and with the event the very next day I was scrambling to make some cupcake toppers for the next day. I finished work late, so no shops were open and I had to make do with things I had around our house. 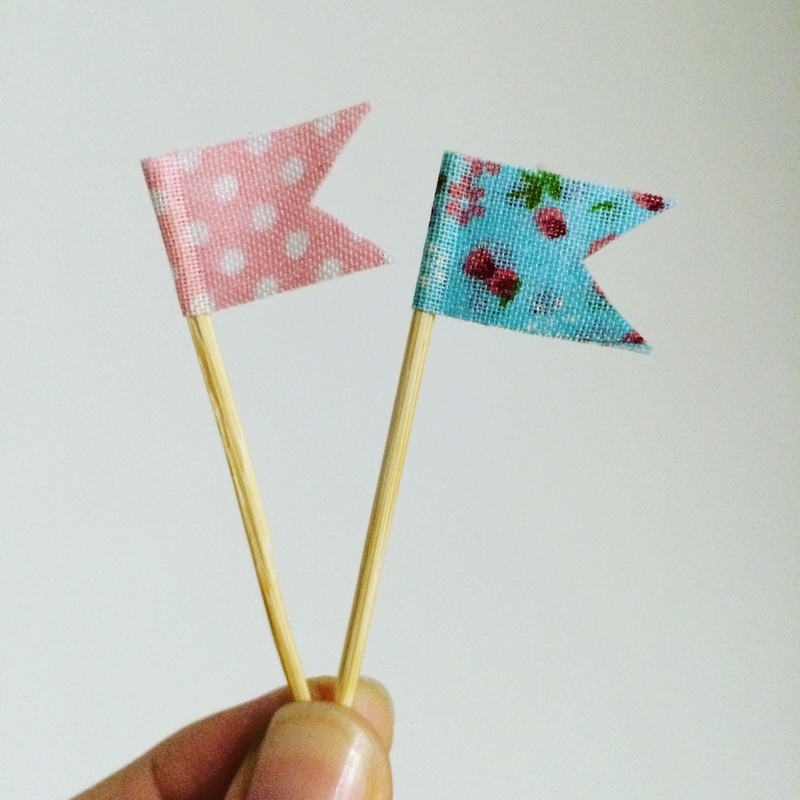 Cue – fabric sticky tape bunting toppers! These were SO easy to make, I made 24 in about 15 minutes and they’re just so adorably cute. I grabbed some fabric tape that I had laying around (the gods were looking down on me in the stressful time I think! ), and I cut a 3cm (~ 1″) strip, wrapped it around a toothpick, and then just snipped inwards on either side to create the bunting look. The overall flag size was about 1.5cm (0.6″) which was perfect for the cupcakes I made. Just wanted to share this really quick, simple DIY as it’s too easy (and cute!) for me not to share with you guys. My friend had an amazing day and night, and we made some awesome memories to celebrate her wedding coming up shortly. I feel very lucky to be included in such a special time as her Maid of Honour. « New Fabrics .. What to Do?